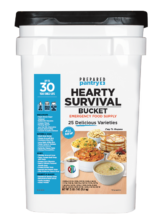 With this special offer you will receive one (1) Hearty Survival Bucket. 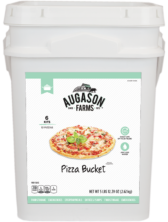 Most everyone loves Italian and Augason Farms Italian Variety 4 Gallon Pail will truly be a hit for your family! 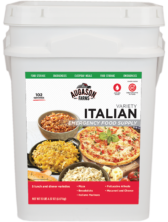 Each pail contains a mix of Pasta dishes and our beloved pizza ingredients! With this special offer you will receive one (1) Hearty Survival Bucket monthly. 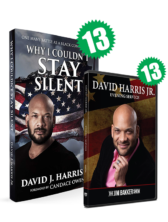 With this special offer you will receive thirteen (13) Hearty Survival Buckets. 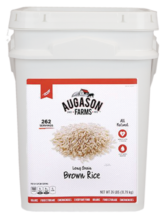 The Augason Farms® Creamy Chicken Rice Pouch is loaded with goodness and nutrition. 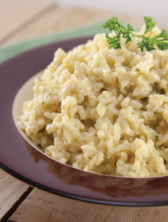 You will enjoy this wholesome, thick, rich and flavorful dish of savory chicken flavor and velvety rice in a delightful white sauce. 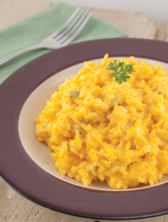 Simply add the indicated amount of hot water and have a meal ready in minutes or add the freeze dried Creamy Chicken Flavored Rice to your emergency food storage supply. Augason Farms Cheesy Broccoli Rice Mix is rich and creamy, loaded with vegetables that provide needed vitamins. Cheesy Broccoli Rice is a satisfying entree you are sure to enjoy. 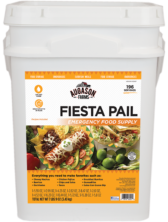 Simply add the indicated amount of hot water and have a meal ready in minutes. While white rice may be the most popular choice for emergency food supplies, long grain brown rice is even better. 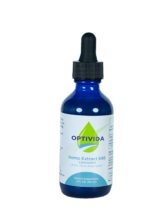 Not only is it packed with more nutrients, it’s delicious with any meal. 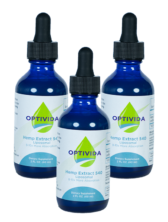 Use it in salads, casseroles, or as a nutritious side dish. Whether you’re trying out a fried rice recipe, making stir-fry, Spanish rice or black beans, brown rice is a versatile, healthy staple and the perfect way to add nutrition and substance to your meals today or years down the road.